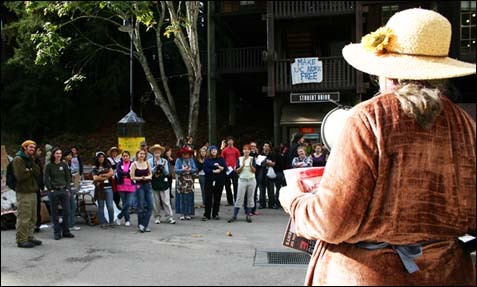 "On Wednesday, November 30 – the UC wide Nuclear Day of Action, approximately one hundred UCSC students took part in a spirited rally at the quarry plaza on the UC campus. 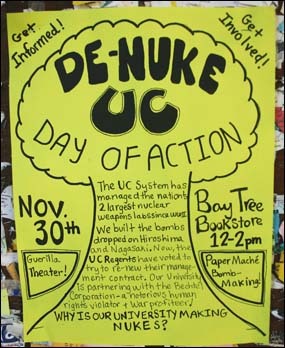 The day’s events, called “DeNuke UC�?, sent a loud and clear message to UCSC administration, the UC Regents as well as President Robert Dynes that Santa Cruz students do not stand for nuclear proliferation in the name of education." 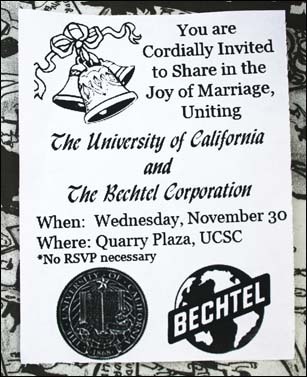 The rally started off with a mock marriage between the University of California and Bechtel Corp., who held baby bomb UCSC. The two were married by the U.S. Department of Energy, who, surprisingly, had actually been ordained as a minister. A member of the Ragging Grannies (a group associated with the Santa Cruz's Women's International League for Peace and Freedom - WILPF) greets students. The Ragging Grannies sing a wonderful song urging the removal of troops from Iraq. 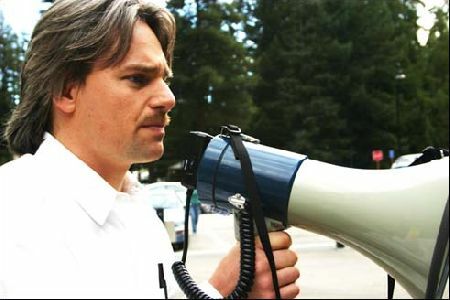 The groom (University of California) reads an actual speech by a UC official about the need to develop nuclear weapons. Student atendees responded with a mix of laughs and boos. 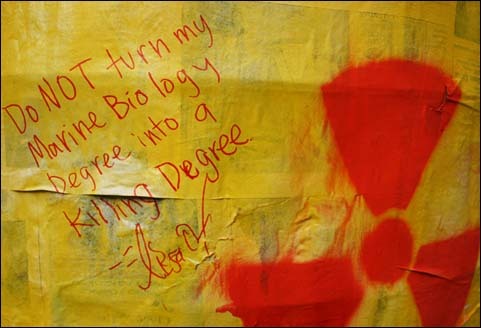 A concerned, and recently fired, university employee speaks about the nuclear research taking place within the system. He speculated that he was fired for speaking out. 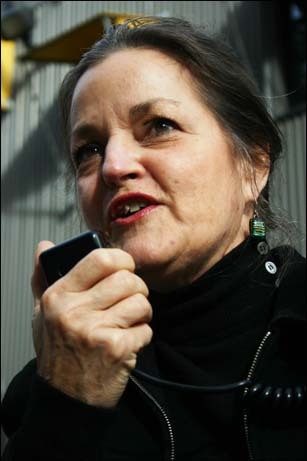 Leuren Moret, a whistleblower from Lawrence Livermore, speaks of how she quit her job once she realized the effect of UC's nuclear weapons research and development. 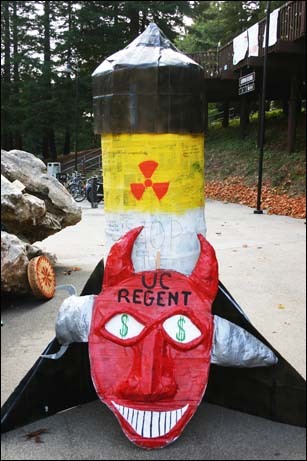 Organizers created this bomb and brought it to the rally for students to write messages to UC President Dynes. 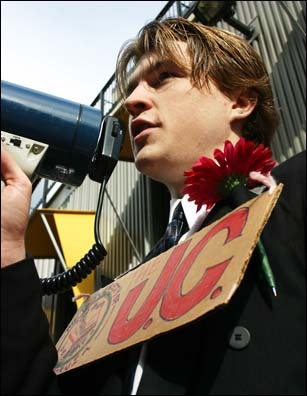 Student organizers also encouraged their peers to call Dynes, registering their opposition to UC's partnership bid with Bechtel in the production of nuclear weapons. 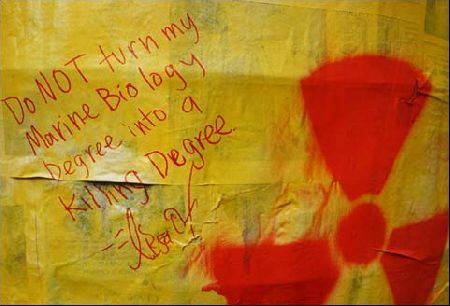 These flyers were posted all over campus prior to the rally - raising awareness about the issue, as many students didn't even know that the UC manages armageddon. 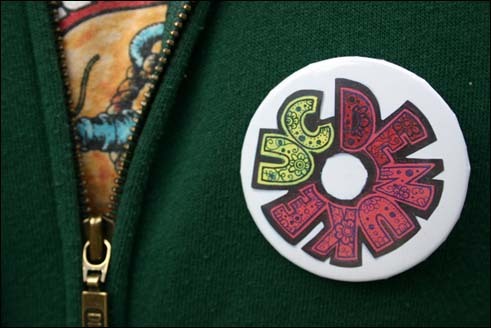 The rally was organized by UCSC Students Against War - who has started to spread these colorful buttons. 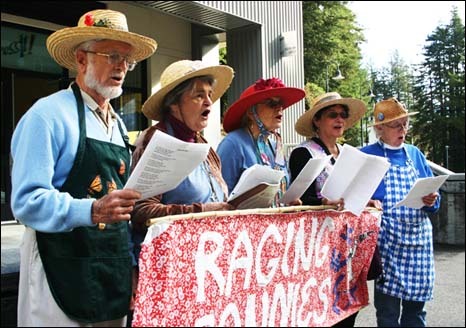 These photos are free and available for use by the organizers of this action. For additional/larger photos or for reproduction in any way, please email sugarloaf (at) riseup.net - thanks!